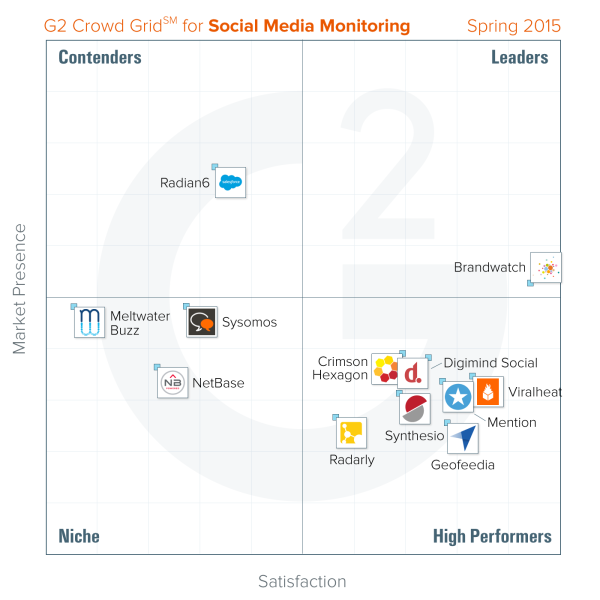 You may have already read that we recently made the top of the G2 Crowd list as the only ‘Leader’ in Social Media Monitoring. This means that we received the highest customer satisfaction ranking from over 400 reviews from business professionals on the G2 Crowd site – not bad. The results from the report have made us more determined than ever to continue to offer the best products and service on the market. Nothing spurs us on more than reading exactly what our customers think and feel about what we are offering – both good, and bad. Over the coming weeks, we’ll be unpicking what people are saying about us. That means celebrating our successes and thanking our users, and also facing some home truths. We’re not perfect – we’ve talked before about our growing pains and the challenges we have faced as we have opened offices across the globe – so there are going to be some frustrations in the mix that we need to address. These reviews will help us do that. On the Grid you can sort by G2 Score, Satisfaction, Name, # of Ratings and Market Presence, and you can then compare different vendors. Pretty neat stuff. On the Brandwatch page (as well as all of the other vendor pages) you’re able to check out all of the reviews, the product profile, a pricing page, and a Q & A page. You can also easily compare and contrast with the competition. Reading through all of this independently offered information should give you a pretty good picture of what it’s like to be a Brandwatch customer. As we touched on before, there’s nothing more useful to a company than a decent amount of feedback. Learning what users dislike about the UI, or find difficult to grasp in the early days of adopting the tool, or finding suggestions of things customers think we should consider adding to the front-end is mega helpful. The answers are varied, often lengthy and detailed, and invaluable. In the coming weeks we’ll be dedicating an article each to digging into these four questions. We’ll be speaking to the people at Brandwatch who can take this feedback and make it reality. When possible, we’ll be getting in touch with our reviewers to see if there’s anything else they’d like to tell us. We listen! We’ll be taking the negatives and trying to turn them into actionable positives. That’s what feedback is for, right? So, look out for the G2 Crowd series here on the Brandwatch Blog over the next few weeks. Are you a Brandwatch customer and you’d like to leave a review? You can do that here.